We Guarantee: Quality of our products: Our products are genuine and are sourced from authorized wholesalers and manufacturers. 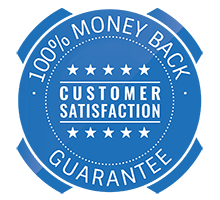 We stand by the quality; in case you are not happy with the product we offer full refund on return of the product. You can return the product within 5 days of receiving it for full refund. In case you have received damaged products or less than the quantity what you have ordered, please let us know and we will make good the loss as soon as possible. Delivery: We use registered post to deliver your order; usually orders arrive in 5-10 working days. In case you do not receive your order within 21 days we provide full refund or reship. Delay or Shortages: In case of shortage or delays in dispatching your order, we will inform you if the delay is going to be beyond 5 days. And if you cannot wait any further we will refund full amount.